This week on Fieldstone Common our featured guest is Daniel J. Tortora, the author of the book Fort Halifax: Winslow’s Historic Outpost. Daniel Tortora is an assistant professor of history at Colby College. An expert on early American and Native American history, he speaks extensively on the French and Indian War and Revolutionary War eras. He leads battlefield and historic tours and has contributed to numerous films, archaeological projects, websites, exhibits and research projects. In 2011, he was appointed to the Fort Halifax Park Implementation Committee. Winslow has grown up around Fort Halifax in its many, many incarnations. Beginning as a French and Indian War garrison and trading post, the fort welcomed historic figures from Benedict Arnold and Aaron Burr to Paul Revere and Chief Joseph Orono. 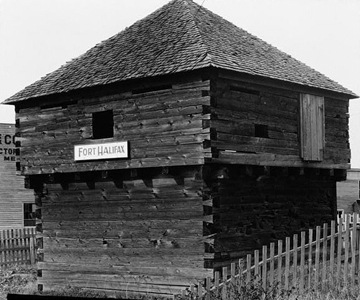 Reduced to one small blockhouse in the 1800s, Fort Halifax hosted archaeologists, travelers, artists, politicians and students. The Flood of 1987 swept away the blockhouse, leaving the fort and its supporters to fight an uphill battle for reconstruction. Throughout varied iterations, uses, trials and tribulations, Fort Halifax has remained the symbol of a community. 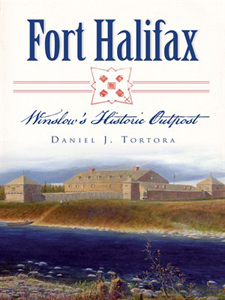 Join historian Daniel J. Tortora in this engaging narrative of Fort Halifax’s fight for survival. Meet the famous visitors to the fort, the local residents who have cared for it and the figures who have kept its memory relevant and its future hopeful. Trade Paperback; 158 pages with end notes, a bibliography, an index, and some photos and illustrations. Fort Halifax: Winslow’s Historic Outpost is available for purchase from Amazon.com and other booksellers. In this interview Daniel Tortora and I discuss the strategic location of Fort Halifax at the confluence of the Kennebec and Sebasticook rivers. Fort Halifax became the most northern outpost for the Massachusetts Bay Colony. Though the history of Fort Halifax as an active military outpost was short-lived it was witness to skirmishes with the Native American population and was host Benedict Arnold during the Revolutionary War. Much of the story of Fort Halifax is the tenacity of its survival and its rebirth with the help of the Daughters of the American Revolution and devoted preservationists. One copy of Fort Halifax: Winslow’s Historic Outpost is given out to the Fieldstone Common audience courtesy of The History Press. Congratulations to our winner and thanks to The History Press for their generosity in donating the book! Question: What’s that’s new stuff in the Fieldstone Common title (FC 90)? Answer: That makes it easier, especially for iTunes and other podcast listeners, to keep track of which episode they are listening to. FC stands for Fieldstone Common and 90 is the number of the episode. This entry was posted in 18th Century, Maine, Native Americans, The History Press and tagged Benedict Arnold, Daniel J. Tortora, Fort Halifax, Winslow by FieldstoneCommon. Bookmark the permalink. Marion, I thoroughly enjoyed this week’s podcast. My family extends back 7 generations to the late 1700s here in Maine so I agree with you, that is was nice to be able to include some Maine history! I tend to search out these books, but had not stumbled upon this one yet. Great Questions! You enabled the author to bring his work to life.